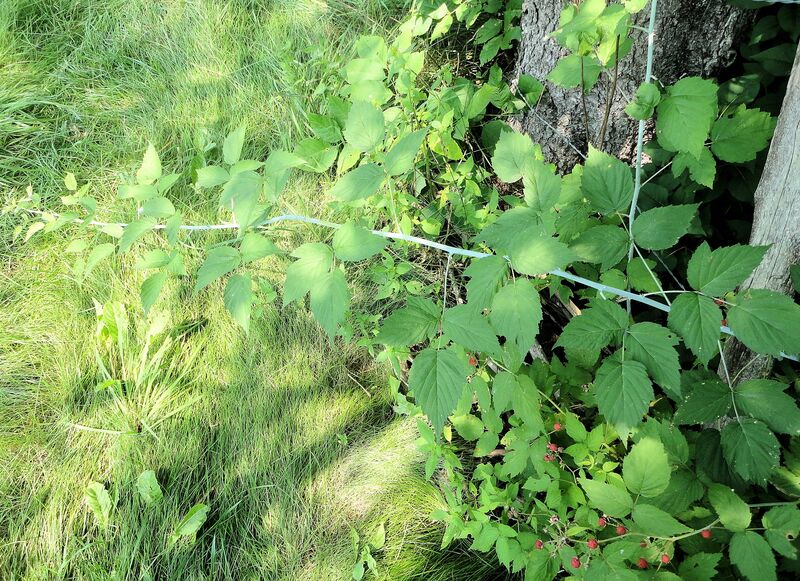 The songbirds planted wild black raspberries along the southern side of one of our windbreaks. I let the canes stay because they are not in the way and they produce delicious fruit most years. Right now is prime black raspberry picking. I’ve been gathering the berries to make a batch of jelly. 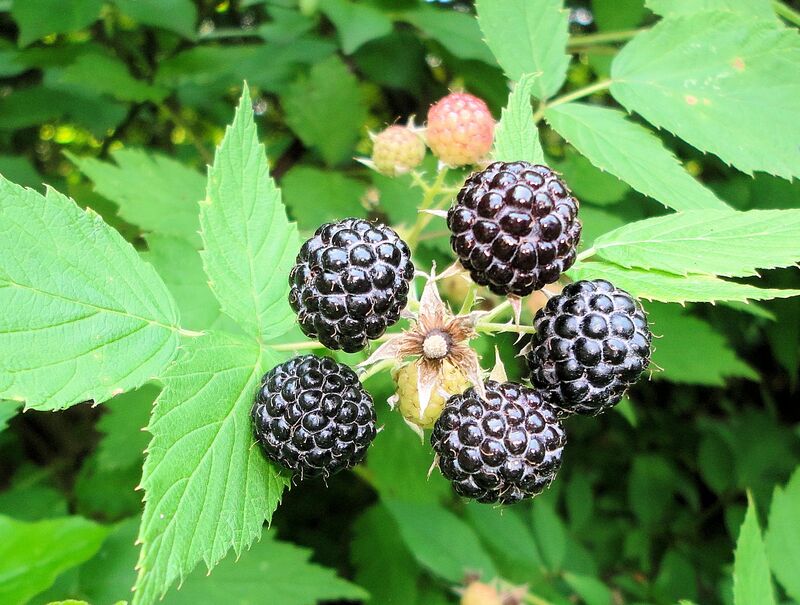 Black raspberries (Rubus occidentalis) are not as well known as their relatives, raspberries and blackberries. All are from the rose family. These are not actual berries, but aggregate fruit forming around a central fleshy stem called a torus. Black raspberries are a separate plant and not the result of raspberries and blackberries interbreeding. 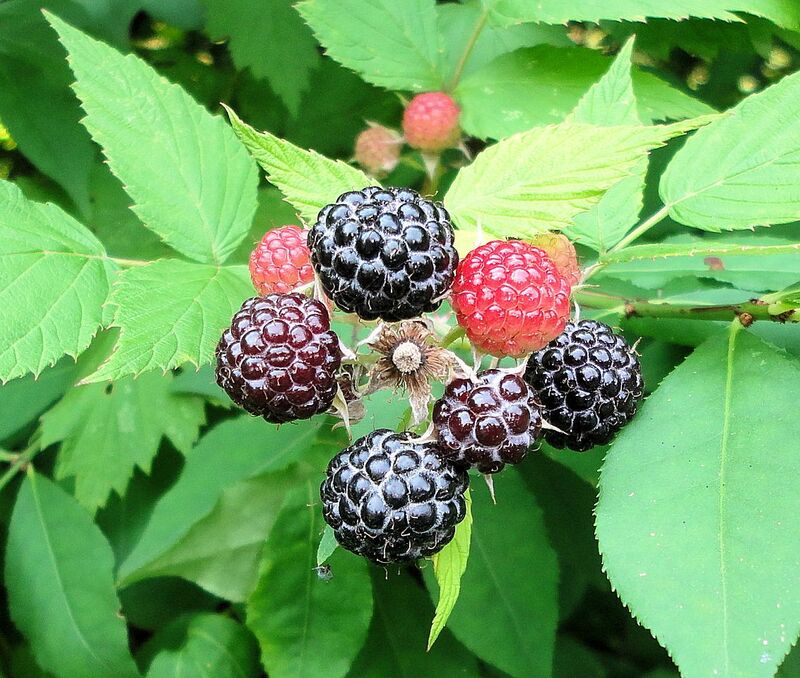 The earliest of the three fruit to ripen, black raspberries are not tolerant of drought. Just a few hot, dry days will cause the berries to dry up and be lost. Some years we get no berries due to a dry week in early July. This year the rain has been abundant, as is the berry crop. The fruit starts out small and white, and rapidly ripens from pink, to red to dark purple-black. A distinctive whitish, waxy quality is present between the individual cells of the aggregate fruit when ripe. These are a drier fruit than red raspberries, lower in sugar and very high in healthy antioxidants. So rich in oxygen free radical fighters, in fact, that black raspberries are showing promise as cancer preventatives. The dark pigment is also an excellent source of anthocyanins, potent anti-inflammatories. I’m sure I appreciate the health benefits of eating black raspberries, but I enjoy the flavor more. These are my favorite wild berries. They are rarer than raspberries or blackberries, and we are lucky to have so many growing around our place. The fruit is held on long, thorny canes that develop one year then bear the next. 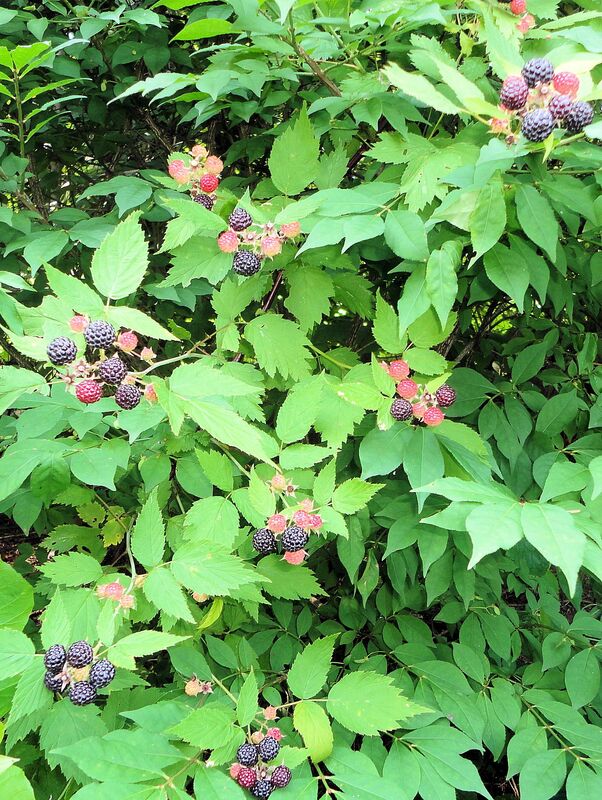 Mature black raspberry canes have a unique purplish-red color. The plant likes partial shade since it is sensitive to dry conditions. It is also more susceptible to mosaic virus that its relatives and is therefore more difficult to cultivate for production. 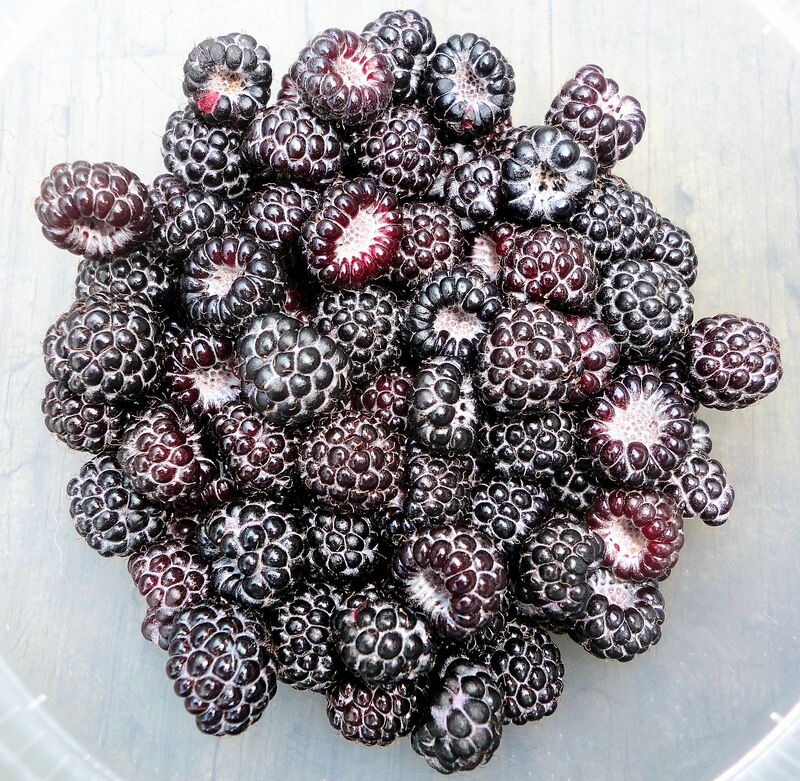 Oregon is a major producer of black raspberries. There are two easy ways to tell the difference between black raspberries and blackberries. First, the raspberries ripen much earlier, in July. Blackberries are nearly autumn fruit. Second, the torus is left on the plant when raspberries are picked, but comes off with the fruit in blackberries. I have now gathered two quarts of berries, enough to make jelly. Time to get out the pectin, sugar and canning jars! 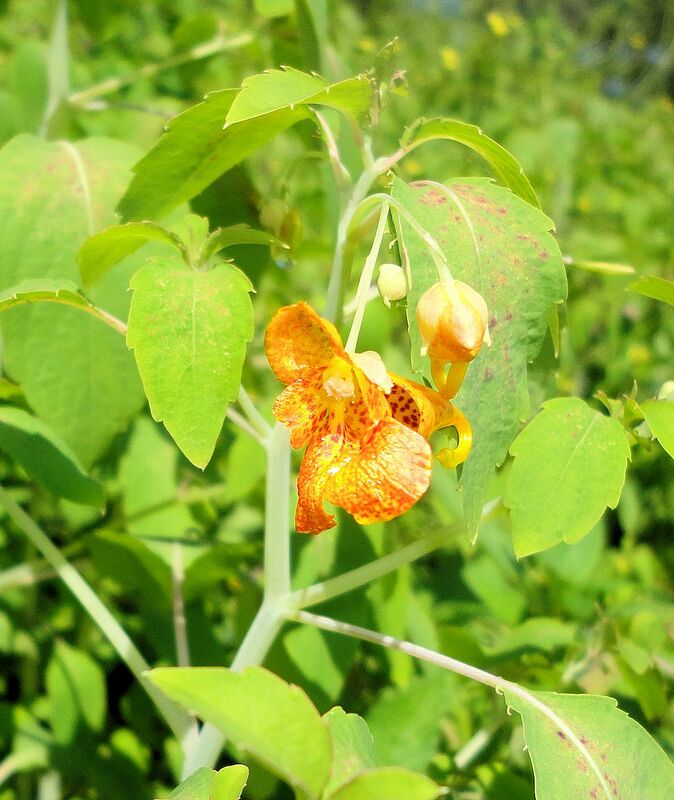 Jewelweed, or Touch-Me-Not, as I’ve always called it, is a native North American wildflower (Impatiens capensis) with many uses. The beautiful little spotted orange fairy hat-like flowers are favored by hummingbirds. 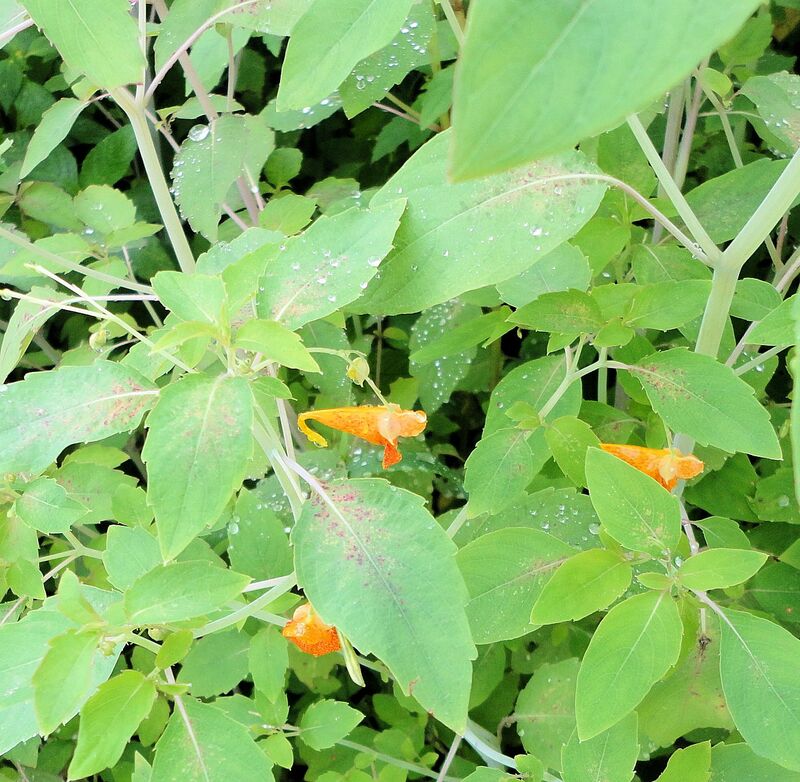 I allow a large patch of jewelweed to grow in an uneven, partially-shaded part of my yard, just for the hummingbirds. 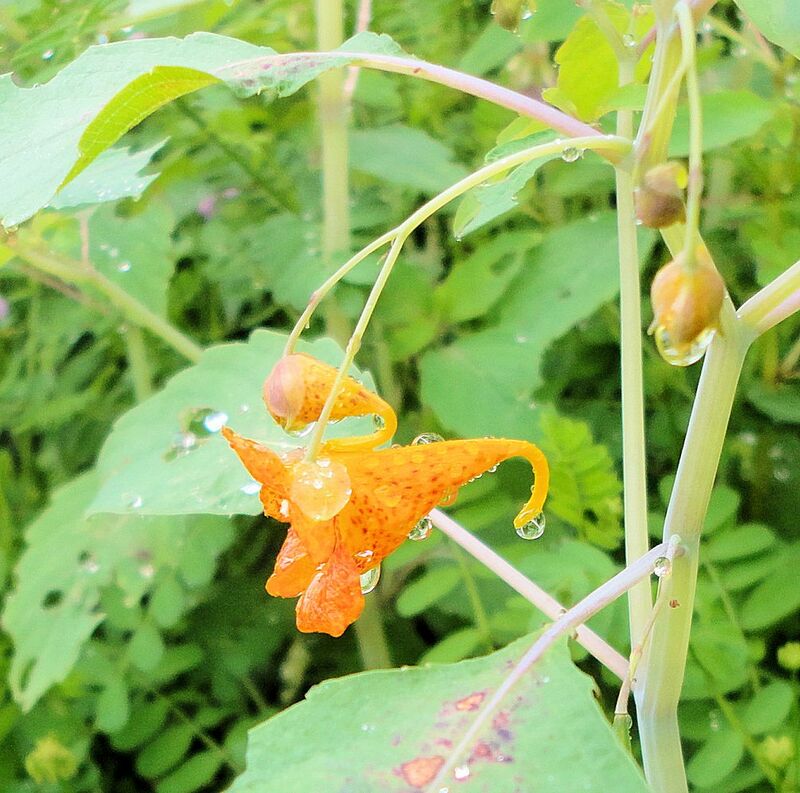 When the jewelweed begins to bloom, the tiny birds abandon the sugar water feeder for the flowers. Nectar is a better source of hummingbird nutrition than anything humans create. The nectar gathers in the curled receptacle at the far end of the flower where long-tonged creatures like butterflies and hummingbirds can reach. Other insects nibble a hole in the curl to get at the nectar. 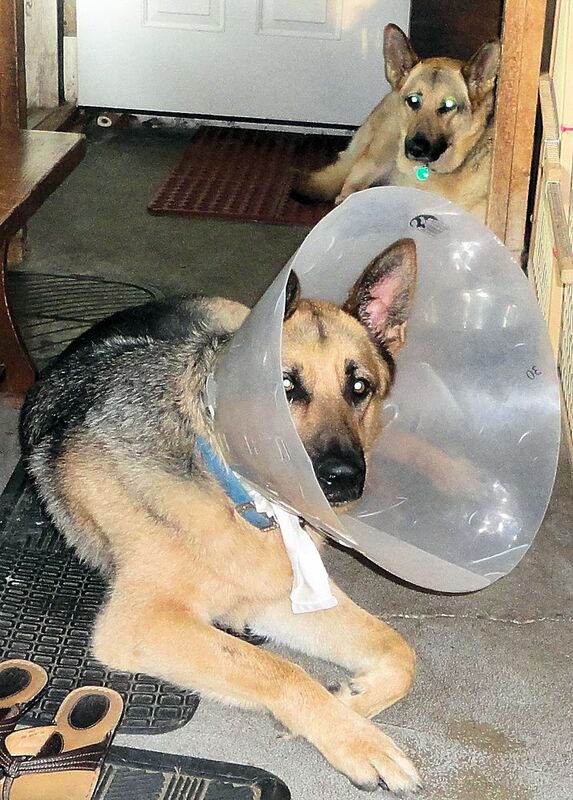 Beyond feeding birds, this plant has many uses. It is recognized as an anti-inflammatory for topical use. 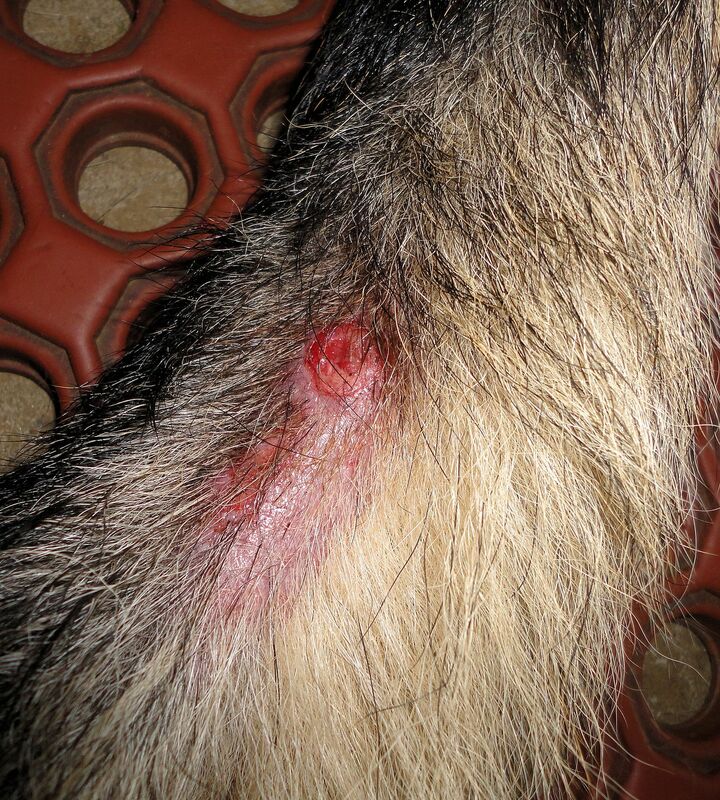 The stem juice of the succulent annual can be rubbed on insect stings and rashes to bring relief. The seeds are also edible and are reported to have a walnut-like flavor. I’ve never tried any. The reason this plant is called Touch-Me-Not is due to the seed cases. The plant has two types of flowers, one with petals and one that is rounded and doesn’t open petals. When this round flower matures, it produces a long case resembling a pea pod. A light touch causes the case to explode, its sections curling tightly and at the same time spraying the seeds for distribution. When I was small I delighted in popping the seed pods. Still do, actually. 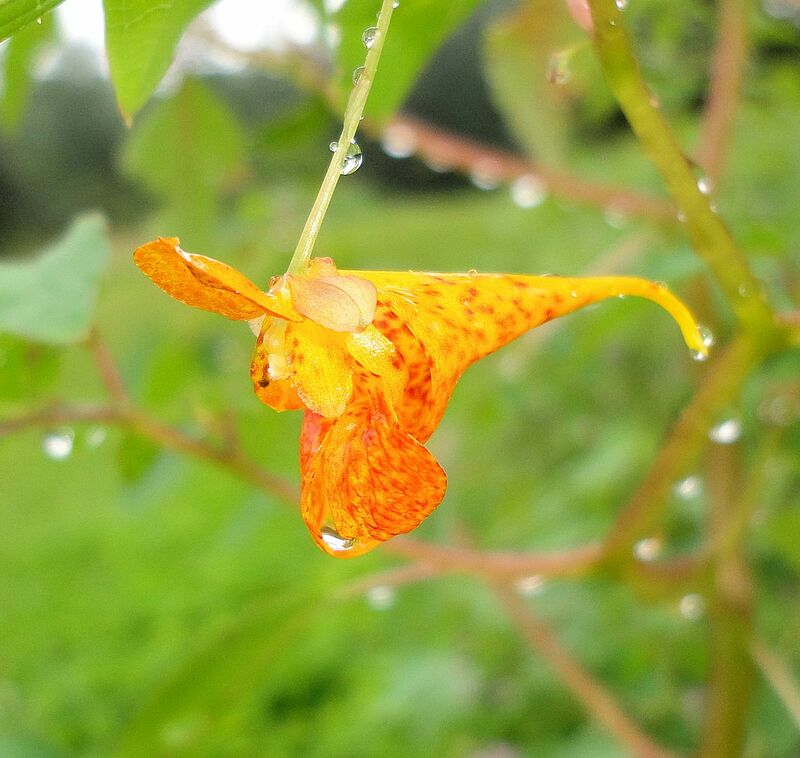 The name Jewelweed is attributed to either the jewel-like colors of the flower or the water-repellent quality of the plant. Water beads on the surfaces and when the sun shines, the droplets glimmer like diamonds. I took some photos after a rain to demonstrate the water repellency. This unassuming little plant has been embraced by the natural remedies crowd. It apparently contains a chemical that is the active ingredient in Preparation H. The anti-inflammatory and anti-pruritic qualities of the plant juice are captured in salves, tinctures and soaps. 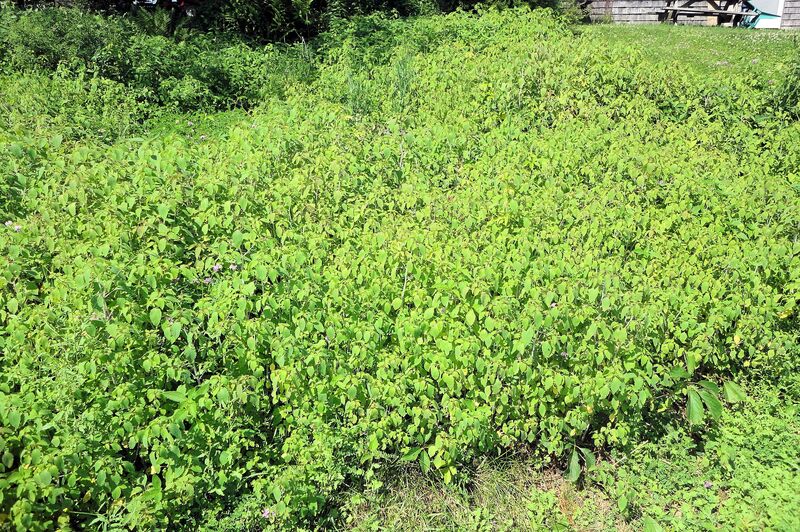 Reportedly, the Native Americans depended on this plant, a natural pharmacy growing in the woods. One year ago today I started this blog. Happy anniversary to me! 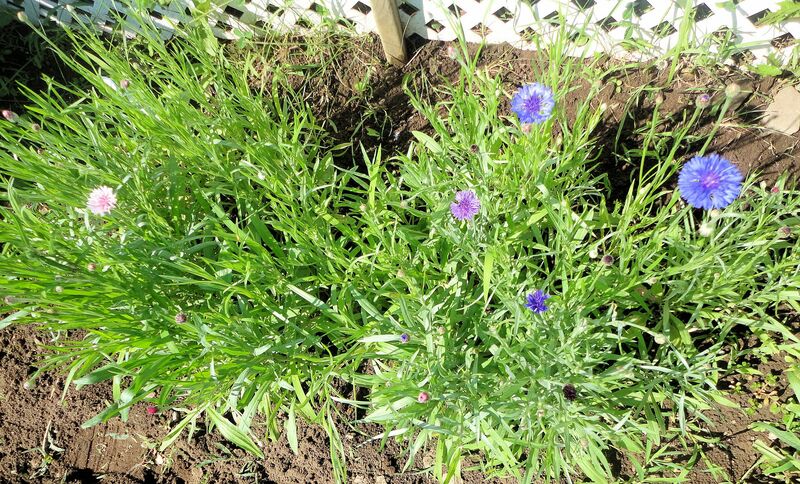 Here are the first bachelor button flowers from my garden to help celebrate! 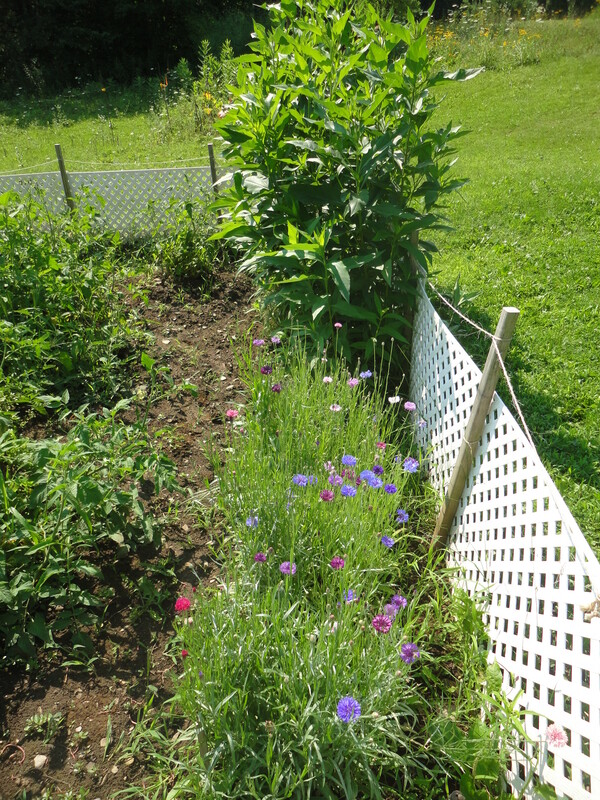 The garden is growing amazingly well. I just completed the second major weeding yesterday, so let’s have a look at how things are going. 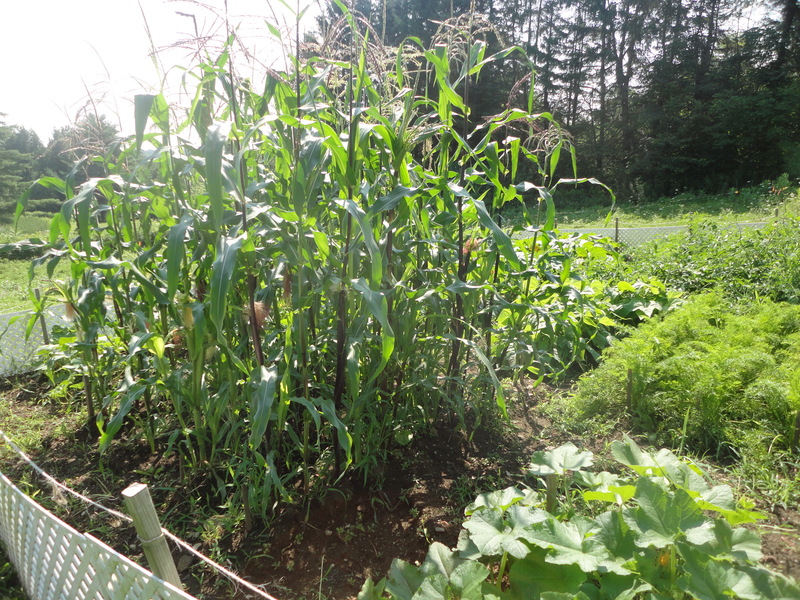 The indian corn is nearing six feet tall. After the hurricane, much of the corn was knocked over. I stood them back up, tamped the soil down at the bases and hoed dirt well up around the stalks. 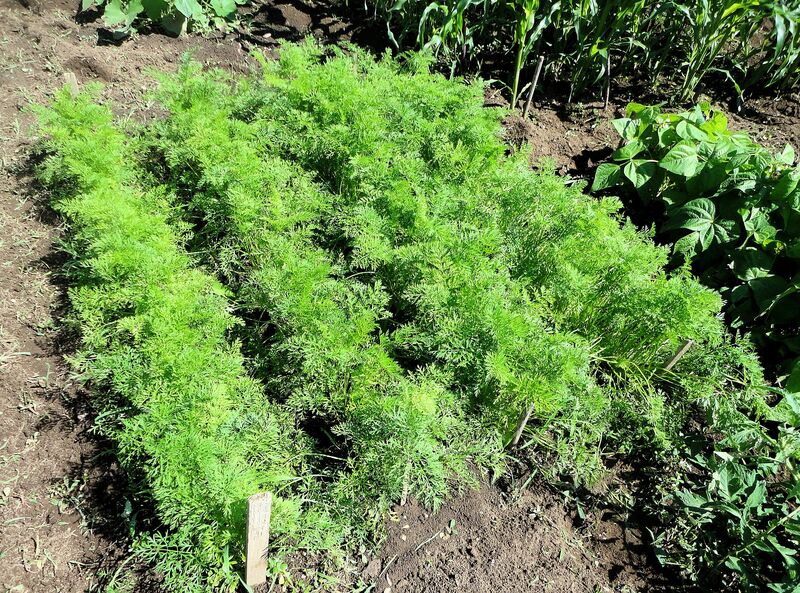 The plants will develop a secondary root system higher on the stalks in the newly mounded soil to increase stability. Such an early hurricane is unusual here and neither the corn nor I were prepared. Now the corn is developing tassels and will soon flower. In the right foreground of the photo to the right are the six wax bean plants that survived from the first planting. 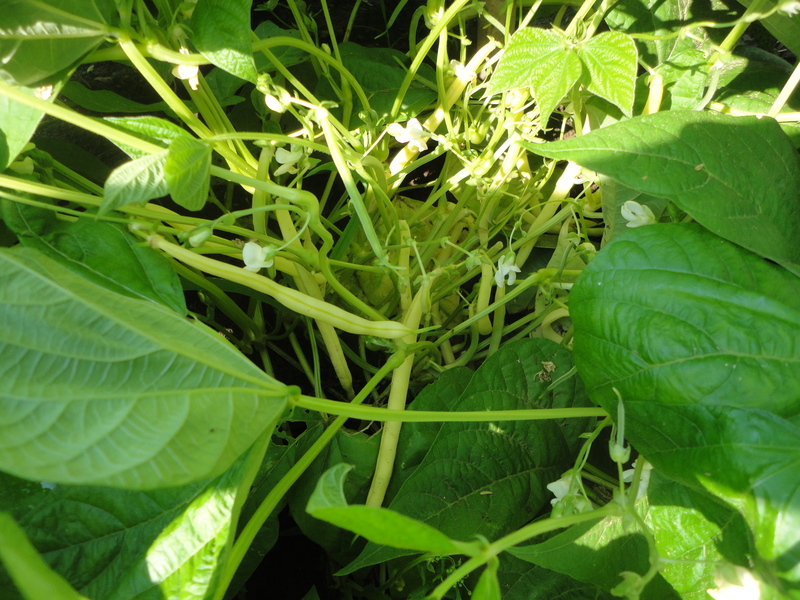 They are flowering and setting beans. Our first bean feast is right around the corner! The second bean planting is growing well. The plants are looking a little yellow. I’m going to side dress them with well-composted manure to see if they will green up a little. 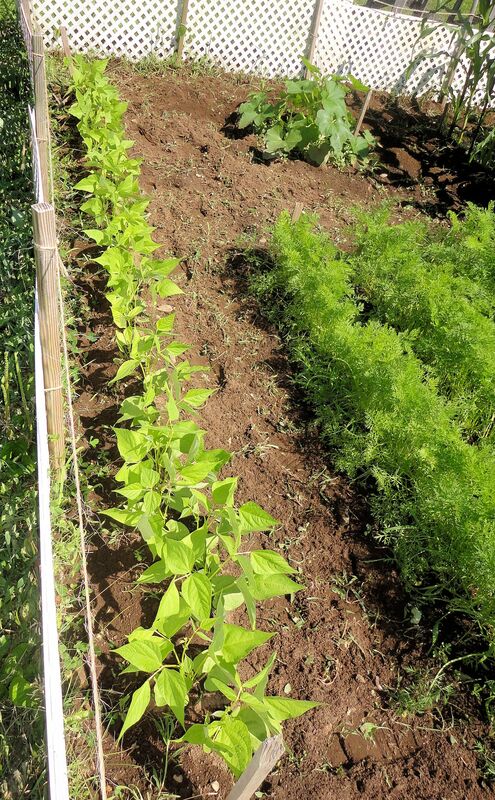 To be effective, the manure will be worked into the soil on both sides of the row and then watered well. Carrots are surging, they love the abundant moisture we have been receiving. I will soon need to do the second thinning on them. The horses and bunnies can barely wait! Most of the baby carrots are about half the thickness of a little finger at this point. I may get some big enough for us to eat. 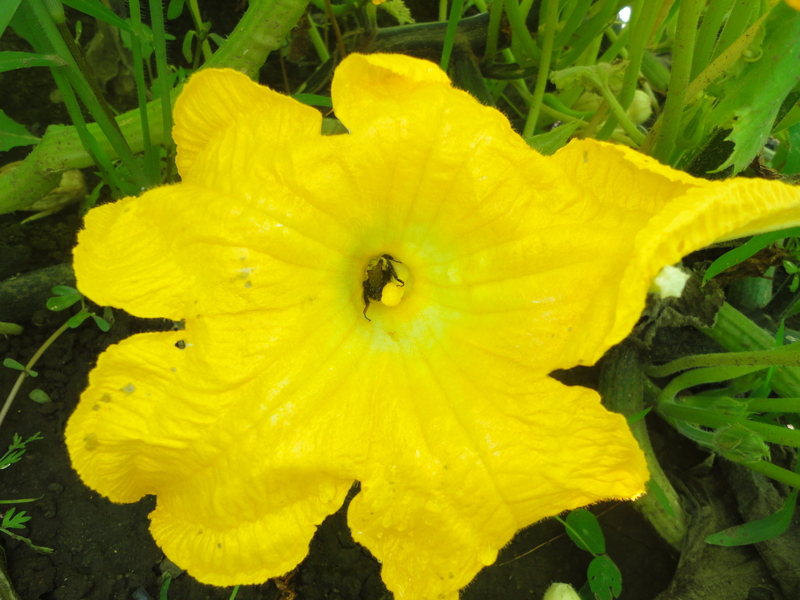 The weather has been mostly hot and humid, just what squash and pumpkins like best. 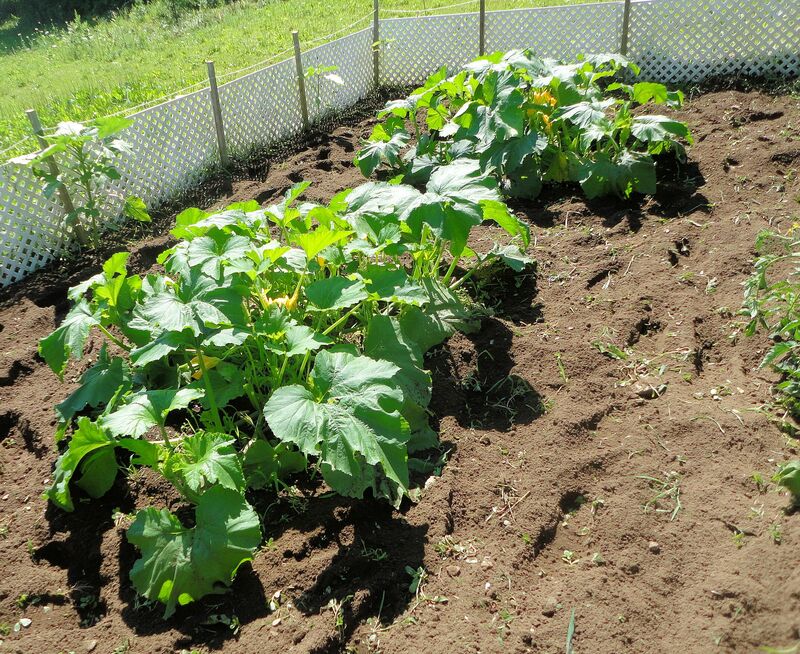 The field pumpkins are beginning to vine. 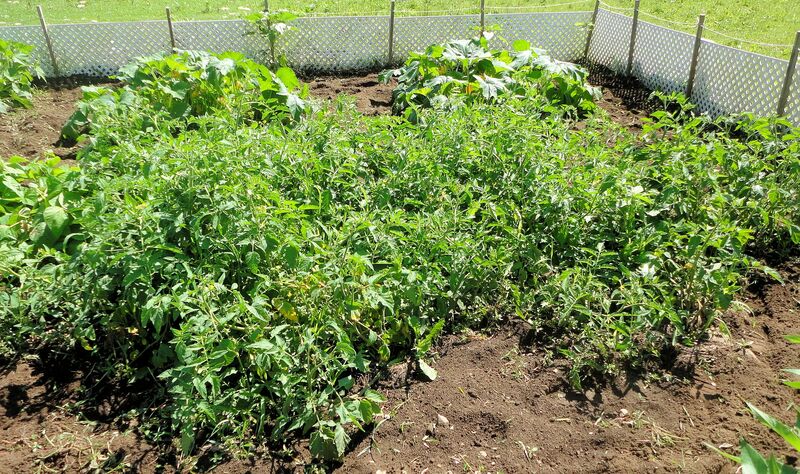 They will take over all the open space around them and then try to invade the tomatoes and corn. 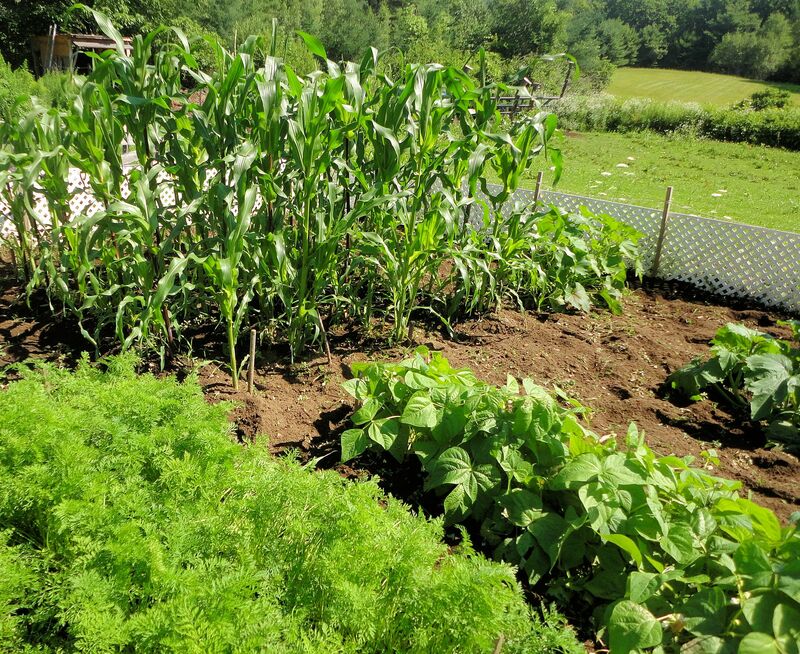 I turn the vines back from the tomatoes, but let them grow among the corn rows. 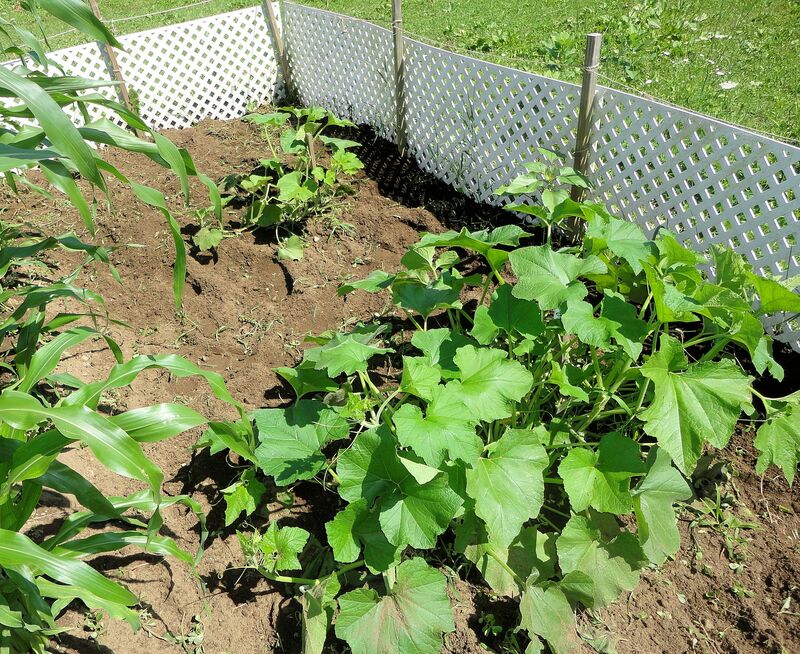 Pumpkins and corn thrive together. 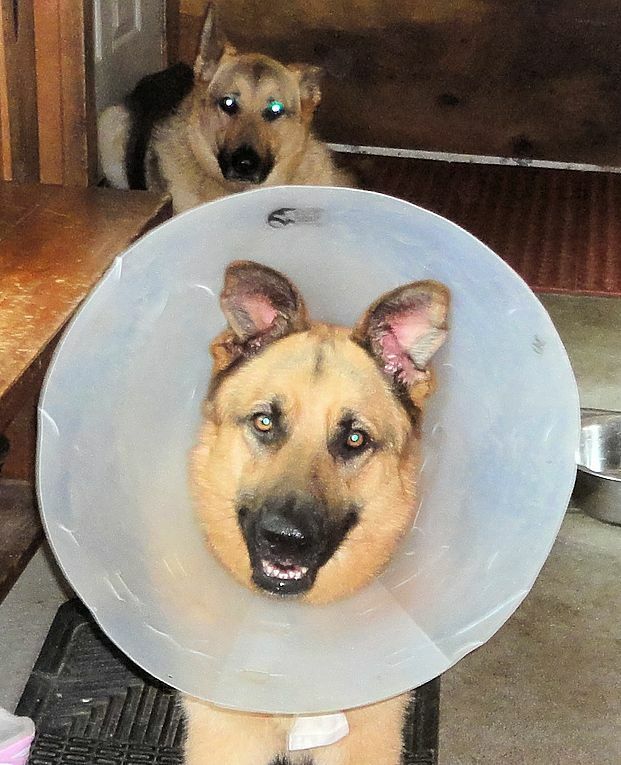 In the background of the photo at right, three sunflowers are visible. They will climb to ten feet or more in height. The dwarf pumpkins, called Jack-Be-Little, have a mixed progress. One hill is doing very well and the other hill is lagging. I have no explanation for the disparity. Both were planted at the same time in identical soil composition. The slower hill took longer to sprout, as well. These tiny pumpkins grow fast so there is still plenty of time for hill two to produce. Finally, we come to the tomato jungle. Conditions are thick. I removed all the sucker growth I could find last week. 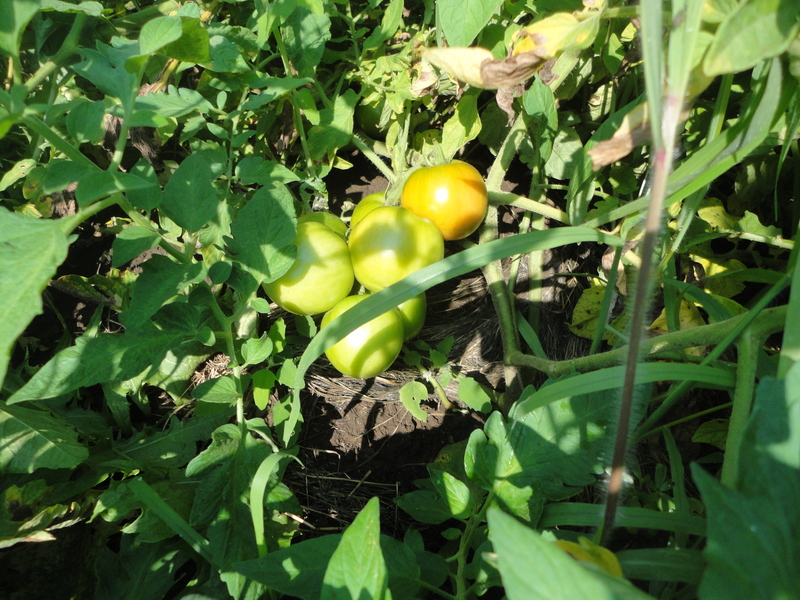 The plants have set lots of fruit and some is beginning to ripen. I can hardly wait! Now we have to contend with the tomato hornworms, a real threat around here. One day the plants look lovely, the next day areas will be stripped of leaves, the branches sticking up like winter trees. Close examination will reveal fat, green caterpillars as big as a finger busily consuming the leaves. These pests must be stamped out quickly before they destroy the crop. The Jerusalem artichokes are forming flower buds. 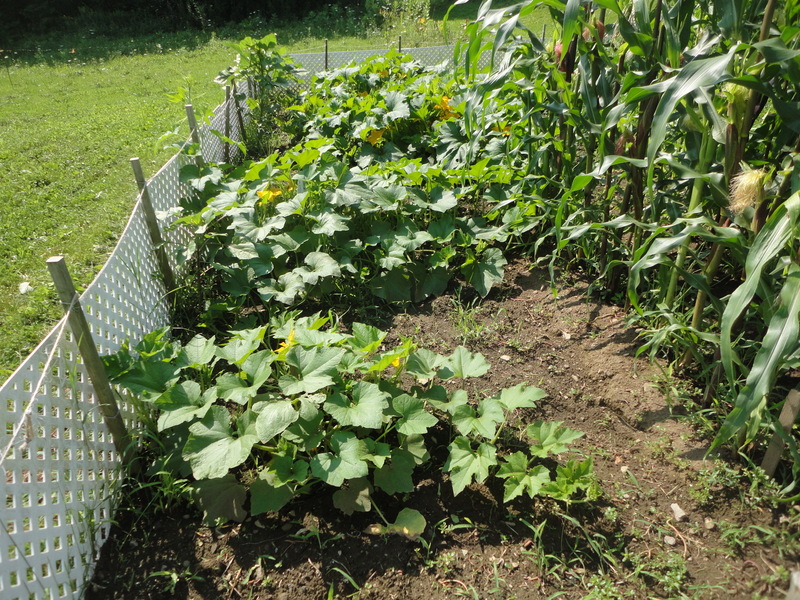 A hill of winter squash thrives uphill from the corn. 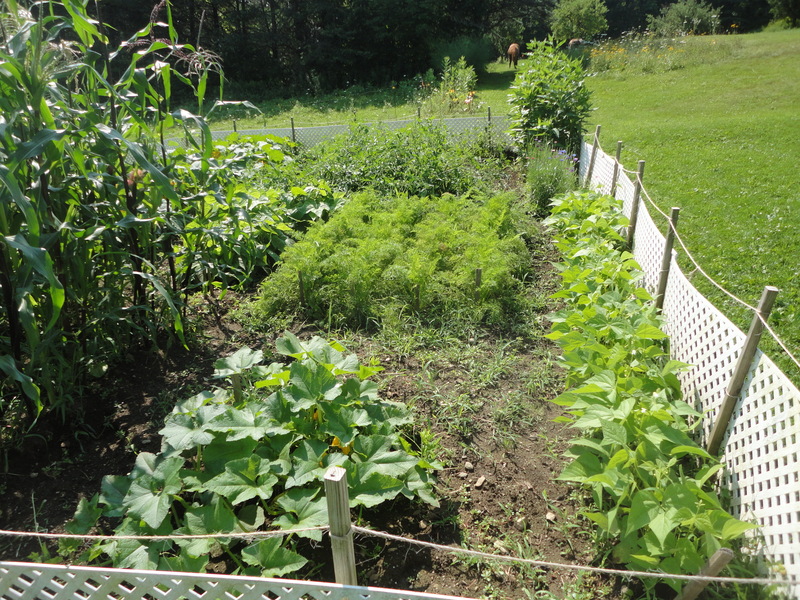 The row of radishes is gone. Three good servings of radishes were produced. What was left bolted to flower due to the heat so I pulled the plants and fed them to the horses. 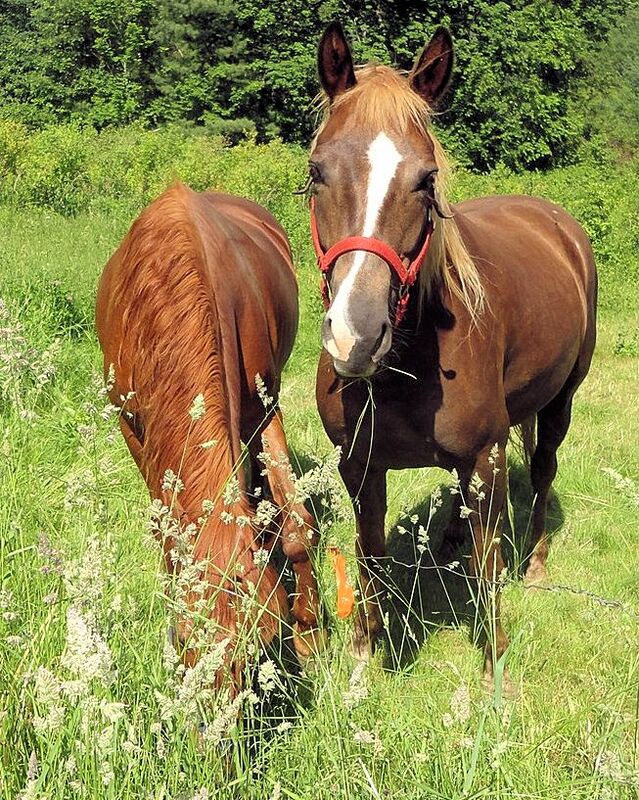 My horses enjoy anything I give them from the garden. I didn’t believe they would eat radish plants, but they gobbled them down. They must be epicureans! 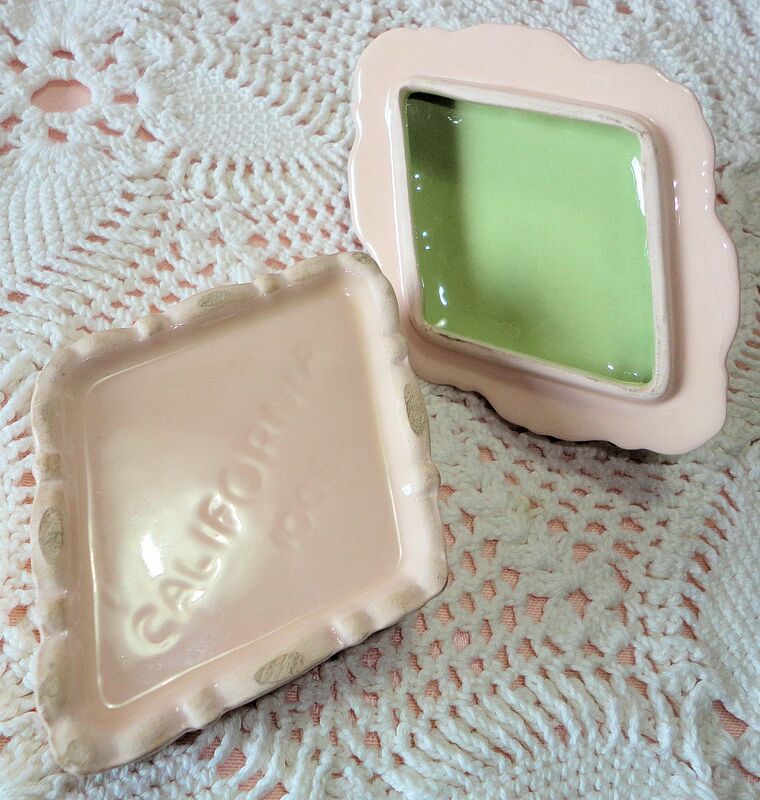 Occasionally, I find a well-preserved piece of vintage pottery made in California. 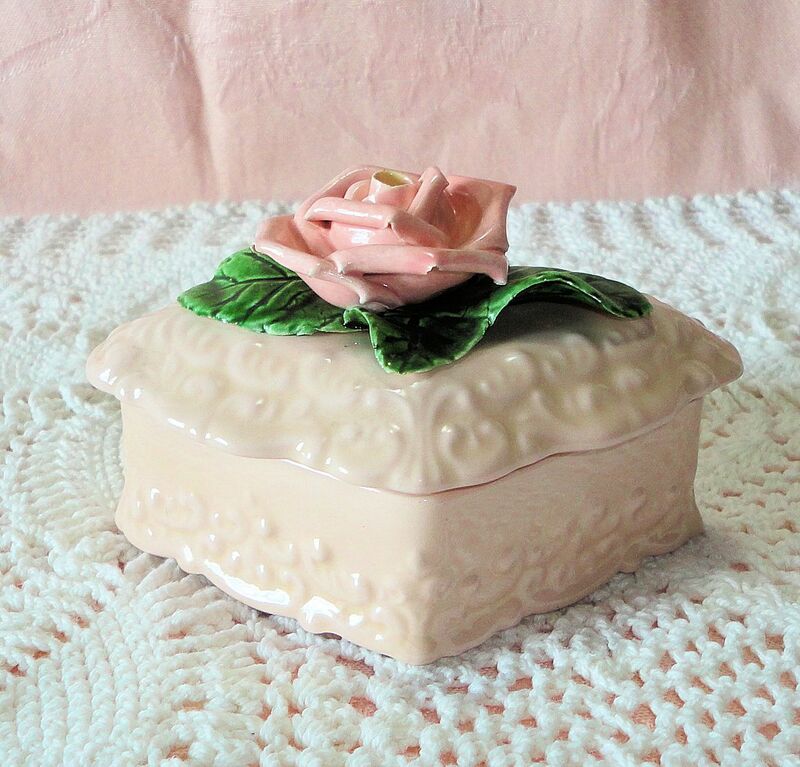 This lovely little trinket box with one perfect capodimonte rose blossom in full bloom was sitting on a shelf of otherwise undistinguished nick knacks at a local second-hand shop. Probably made last mid-century, the piece has no damage other than some long, thin crazing on the outside bottom half of the box. That the delicate petals of the rose survived so many years without a chip is a miracle. This piece is marked only with California in block letters and the model number 100R. I do not know the maker. 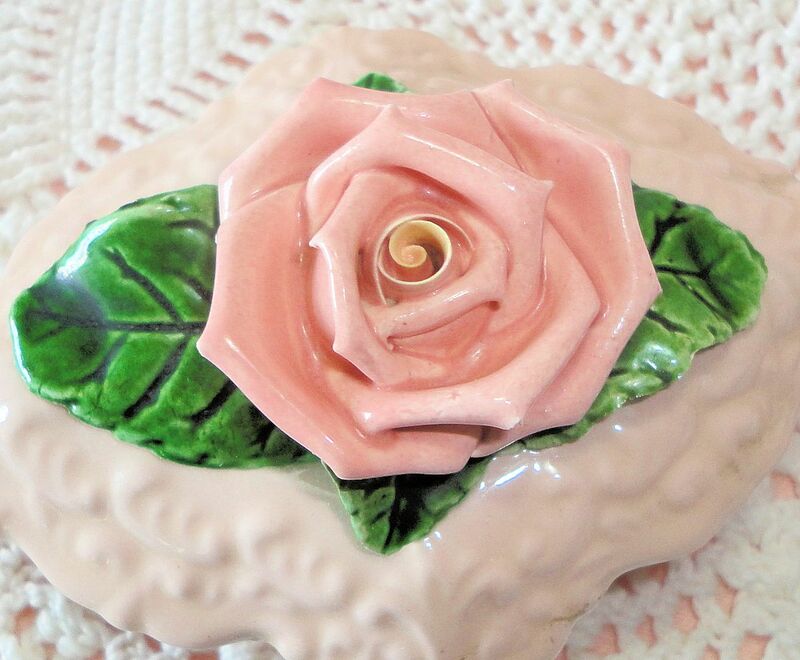 From the early 1900s through the 1960s, at least, ceramic production boomed in California. 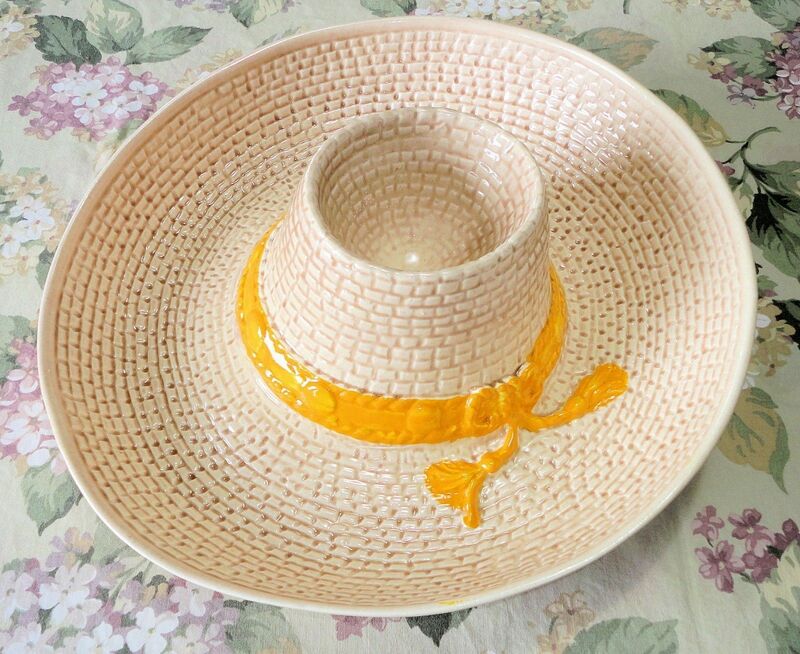 Centered around San Franciso in the early part of the century, and spreading south to especially around Los Angeles, hundreds of potteries produced innovative designs and shapes still very popular with collectors today. Many pieces that I find are marked only with the word California. Sometimes it is possible to identify the maker by the design or shape, often the producer remains unknown to me. California was (and still is) a melting pot of cultures that provided ample inspiration for unique designs. 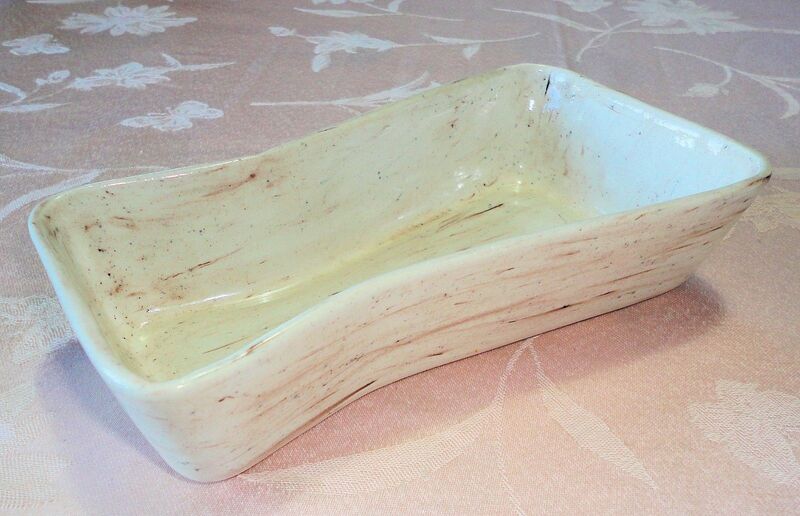 The native soils are a source of fine quality clay perfect for ceramic production. Early ceramics chiefly supplied the needs of builders with various tiles for roofs, walls and water conveyance. 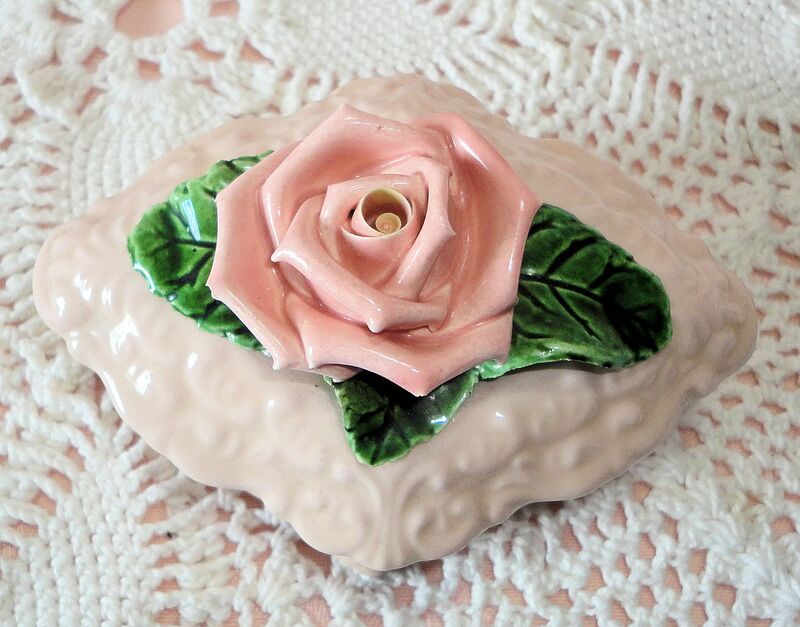 As the population and demand grew, decorative items came into production. 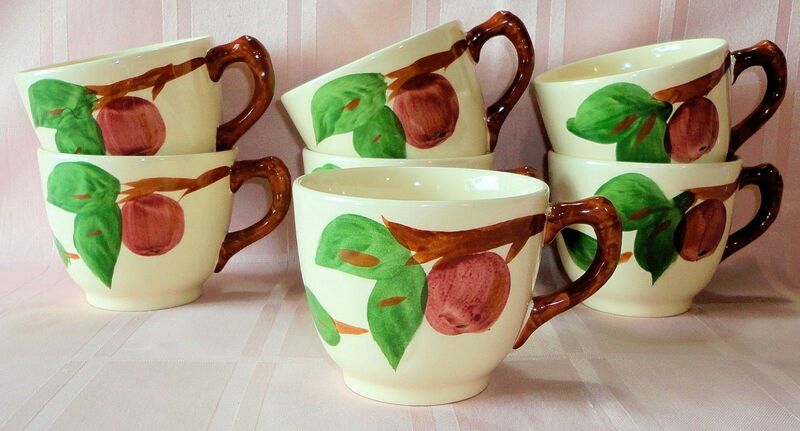 The 1930s through the 1950s were a heyday for California potteries. 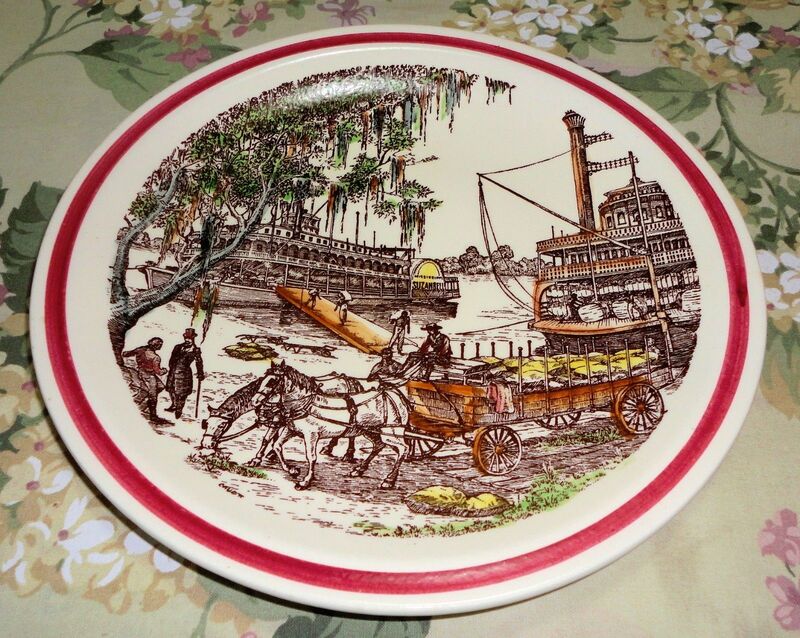 Much of the vintage ware found today is from that period. There are many very famous potteries including these that I have carried in my online shops: Franciscan, Metlox, Vernon Kilns and Catalina. Here are some of the items I have currently for sale. 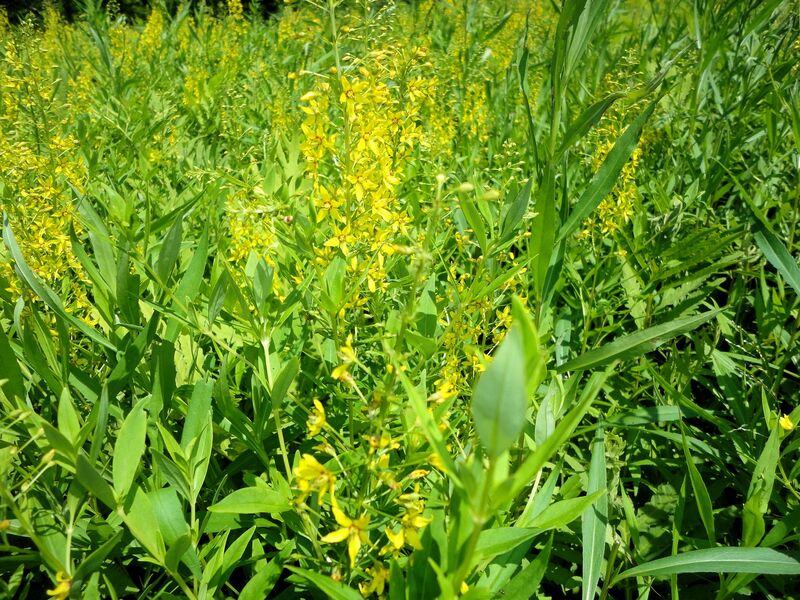 An oddly romantic name for a wildflower, Swamp Candles are also called Yellow Loosestrife (Lysimachia terrestris,) and they are native to North America. I had never seen this flower until I found it while mowing with the tractor. A wet area near our orchard was covered with the Candles in full bloom. Before mowing them all, I did a bit of research. 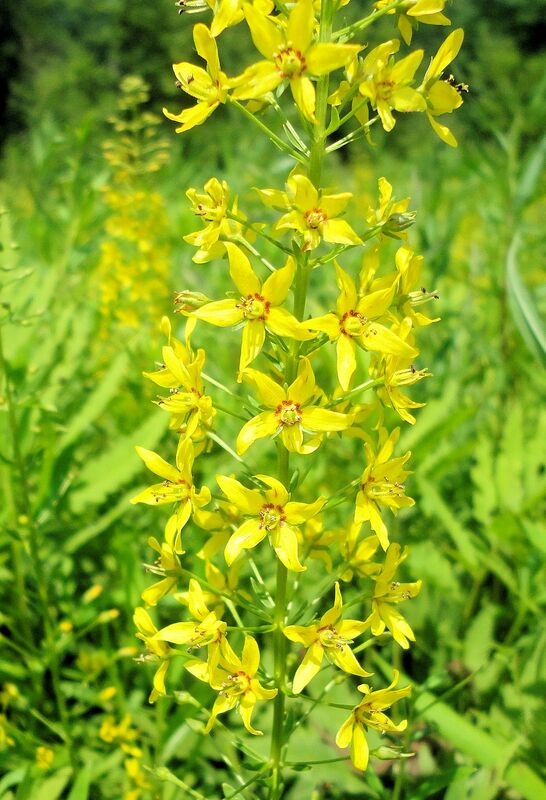 Yellow Loosestrife, from the Primrose family, is actually endangered in Kentucky and Tennessee. The plant grows in moist spots such as the edges of ponds and streams, or in marshes. It is a perennial reaching about 24″-32″ height. The flowers are striking, growing on a tall raceme. The five yellow petals have red dots at the base with each flower forming a star. I was able to preserve a good-sized area of the Candles. Since they have not bloomed here before, I’m not certain where they came from or if they will appear again next year. The place where they grow changes it’s flora over the years. Sometimes it will be all fern, other years, blue flag iris pops up, or swamp grasses. In very dry years, field grass predominates. This year was wet, perhaps giving the loosestrife seeds the upper hand. 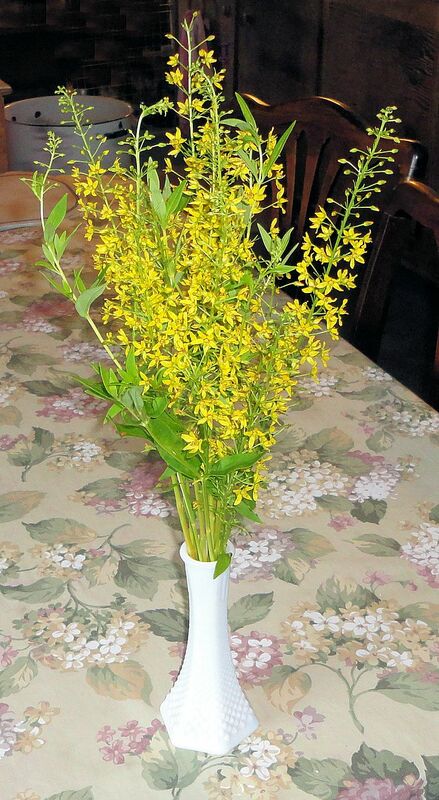 Several flower stalks were pushed down by the tractor, and I salvaged them to make a bouquet. The blooms lasted four or five days. They would be excellent fillers or good for adding height in a large arrangement. 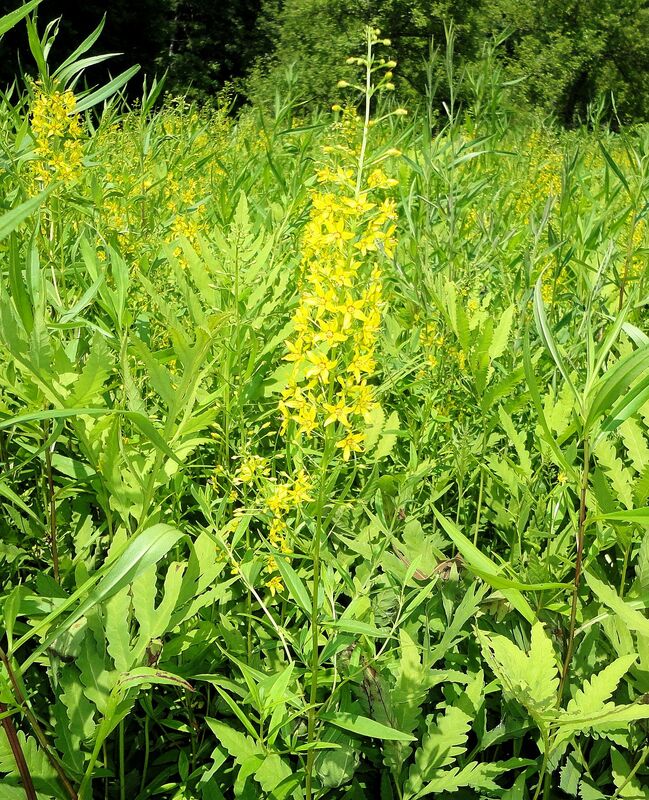 This entry was posted on July 8, 2014, in Uncategorized, Wild Plants and tagged Lysimachia terrestris, North American wildflowers, star-shaped flowers, Swamp Candles, wetland flowers, wildflowers, yellow flowers, Yellow Loosestrife.